I would think so :) She's been wanting company after all. I love the happy ending. The poop is hilarious!! I hope your day is getting better! Awesome, Yasmine! Greetings from Chile. 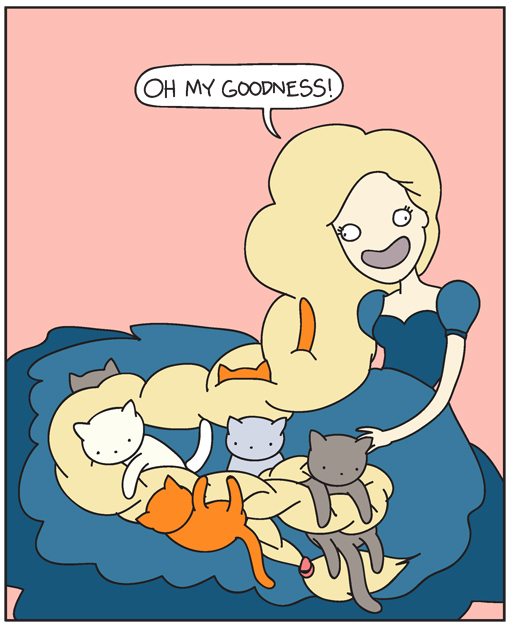 That's actually a genius idea: Do a series of classic fairytales where you rewrite them featuring a cat theme. It would be great! Aw, I'm glad for you guys! I love it/my dream fairy tale ending, but just to be OCD, the "gosh, these little guys seem unusually heavy today" panel is in there twice. Perfect! I squee my prince too! We have 3 kitties. A prince AND cats. Could a girl ever want anything more? 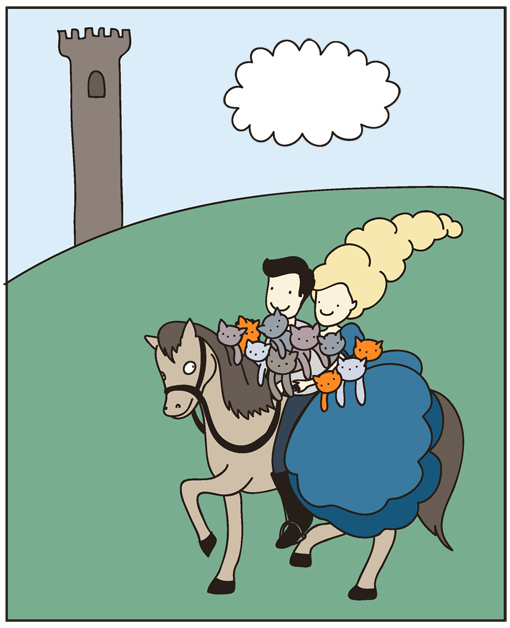 So lovely ... A Valentine's story ! 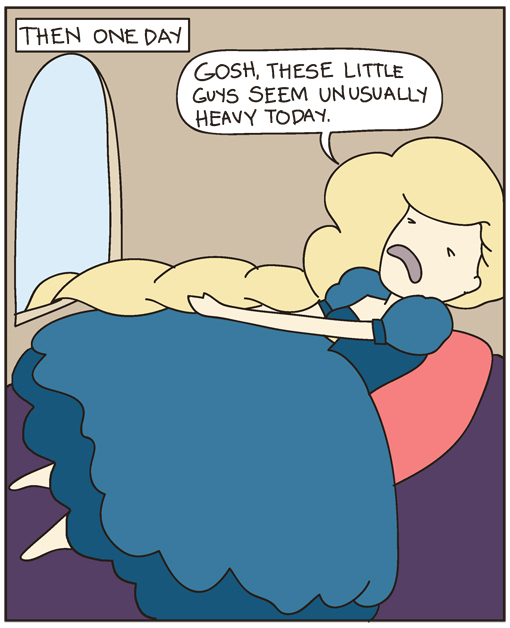 Best version of Rapunzel ever! I LOVE THIS! 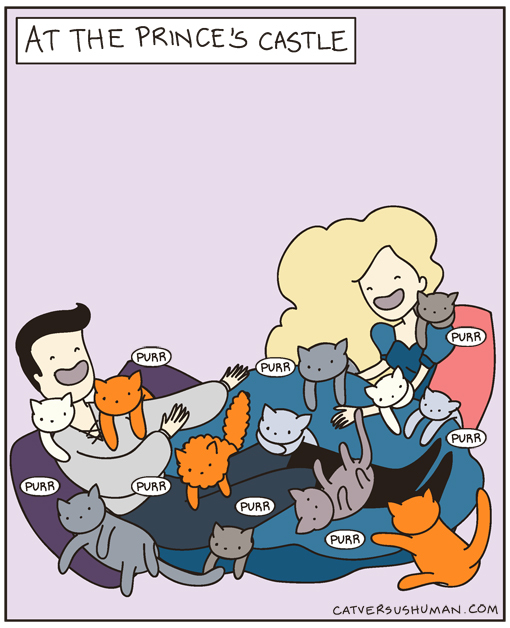 This is every Cat Woman's fantasy! AWWWWW!!!!! I think this is my favorite one yet! So cute. I LOVE IT! 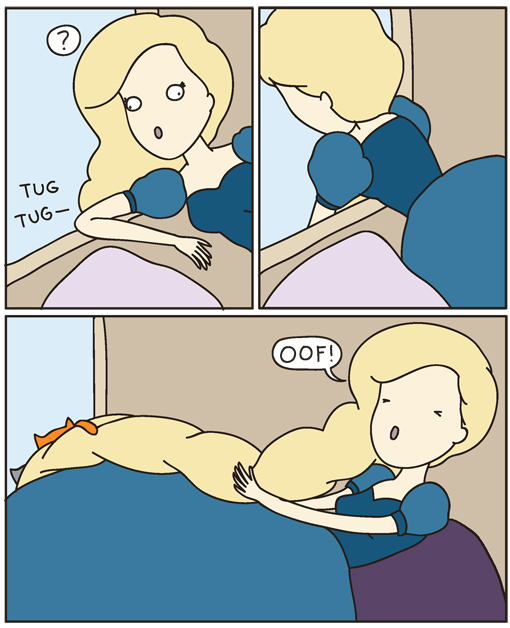 Can I see the disney movie based on this comic please?!?! A really happy fair tale!!! Wow this is great!!!!!!! I love it!!! 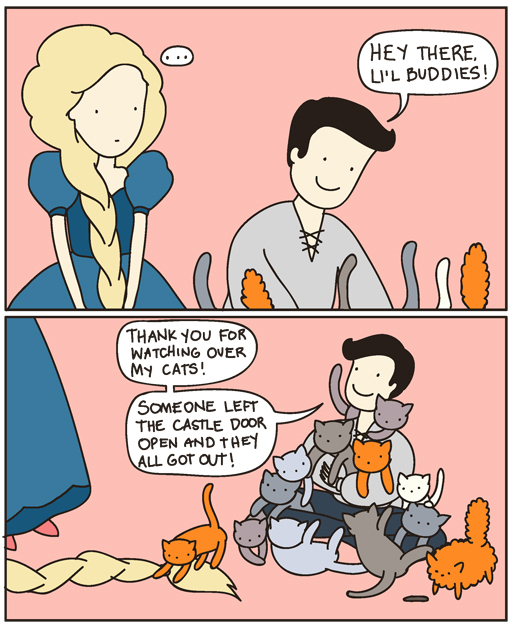 Fairy Tales are really better with Cats! Love this. Thanks! 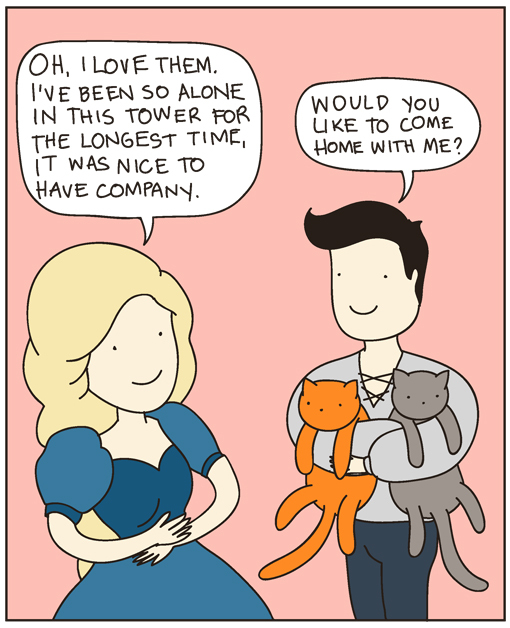 Lovely tale, a Prince who loves cats is what the best a Princess can find !! I loved it! It's the perfect ending kittens and a price :) thank you! This made my morning! Perfect! I love!! This is so adorable! I have been reading your site for some time now and I love all your posts! 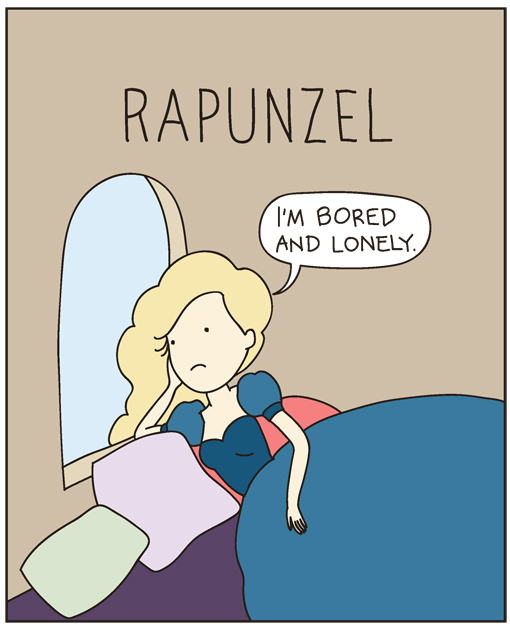 I especially like this one, I quite like this version of Rapunzel! This is definitely the cutest thing on the planet! 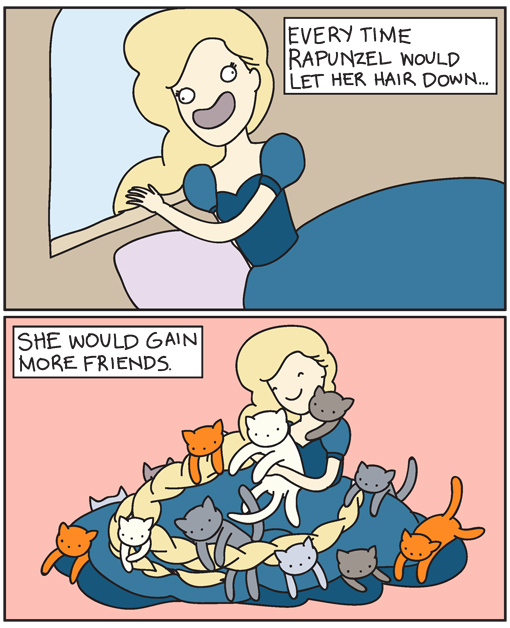 And cats and long hair combined - it is better than Disney's Rapunzel for sure! She knows he's gay, right? Lol, I don't know what to make of this. It's a amazing story. Love it.